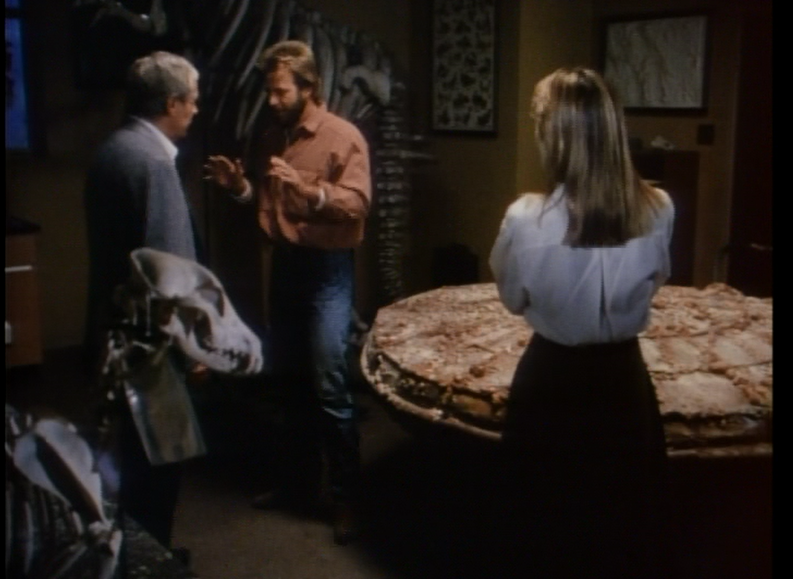 John Kenneth Muir's Reflections on Cult Movies and Classic TV: Monsters: "Sleeping Dragon"
In “Sleeping Dragon,” a sixty-five million year old stone capsule is discovered at a fossil dig outside Reno. The object’s discoverer, Merrick (Kin Shriner) brings it to a local university for further study, but the professor (Russell Johnson) there has grave doubts about its authenticity, even if his beautiful daughter, Lisa (Beth Toussaint) believes the evidence of their eyes. The trio attempts to pierce the ancient capsule with a laser drill, and a carnivorous prehistoric reptile emerges, one that possesses a great, if malevolent intelligence. 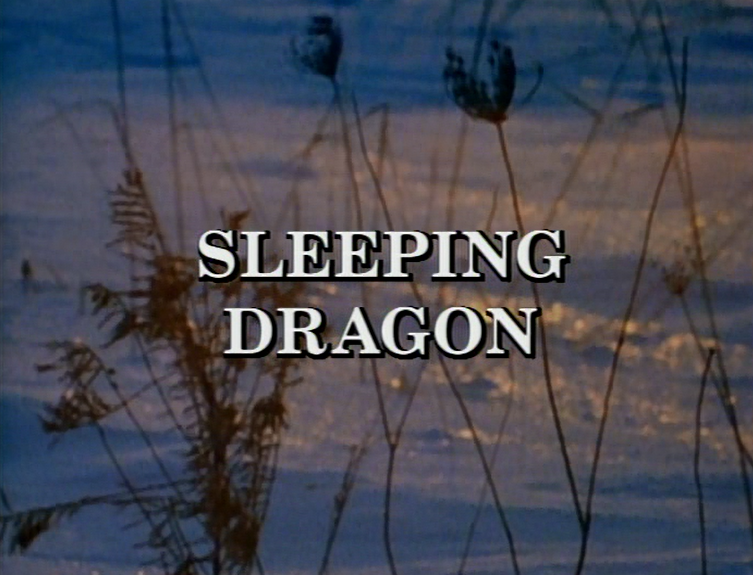 “Sleeping Dragon” is actually the first episode of Monsters I remember watching on broadcast TV, in the fall/winter of 1988. The story is practically a bottle show, set in one room -- a college laboratory -- and in this case the monster of the week, the dinosaur, isn’t terribly convincing. Yet this is a taut, well-directed show that transmits a strong sense of claustrophobia and danger. Outside the laboratory, the snow relentlessly falls and inside the (intelligent) dinosaur has cut the power, trapping its human prey in darkness. 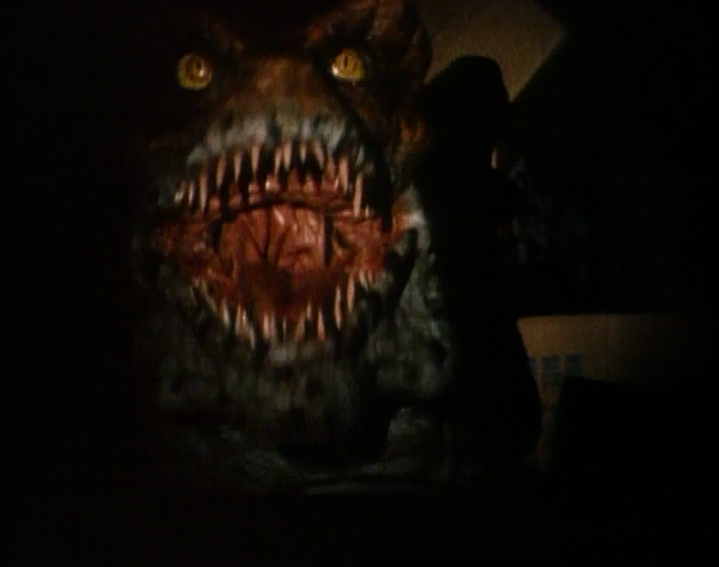 Monsters often plays like a traditional, Grade B, 1950s horror movie, and this episode even has a veteran of that era (and This Island Earth ), Russell Johnson playing a wrong-headed scientist At one point, the professor attempts to talk reason to the dinosaur and he is promptly eaten alive for his troubles. We have seen moments like this both in Howard Hawks’ version of The Thing (1951) and George Pal’s War of the Worlds (1953). But the quality that makes “Sleeping Dragon” hold up today is its core conceit of a dinosaur civilization that saw the end coming and took steps to survive it. These clever dinosaurs went into suspended animation and waited for the climate to be more to their liking. Now, their “alarm clocks” are going off, and they are awakening in the human world. This is not entirely unlike the Silurian/Sea Devil stories in Doctor Who, but Monsters tilts the narrative towards terror by associating the intelligent dinosaurs with early man’s legends of dragons. Perhaps some of these creatures awoke generations ago and confronted mankind. He thus created the dragon stories to describe encounters with them. Also terrifying is the notion that even though they are “civilized” enough to create suspended animation chambers, the dinosaurs refuse to recognize mammals as intelligent beings. 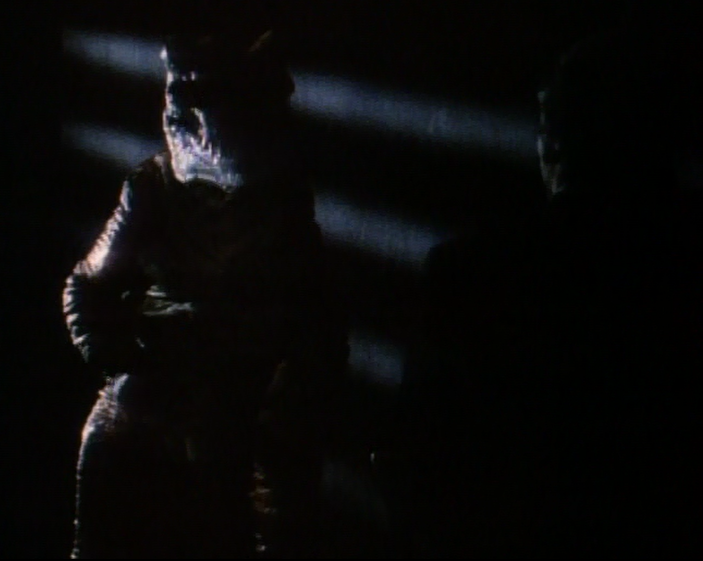 The episode’s denouement -- which reveals that three-hundred and ninety-seven new predators will soon be on the prowl -- is appropriately chilling, and it made me consider that someone could make a pretty good horror movie today out of this premise. With a little more dough, such a film needn’t be limited to one room. Instead, it could be the story of a dinosaur civilization awakening --- hungrily – in the midst of our own. Throw in a message about climate change, and the way we are reshaping the planet to be more to a reptile’s liking, and you’ve really got something. This one is tons of fun.